Install the sensor with the nut. Make sure that the knock sensor is in the correct position. install the intake manifold insulator onto the cylinder block. 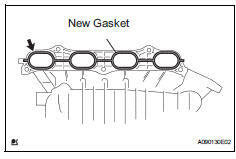 Install a new gasket into the intake manifold. Install the intake manifold with the 5 bolts and 2 nuts. Fit the union to check valve hose into the vacuum hose clamp. Connect the camshaft timing oil control valve connector. 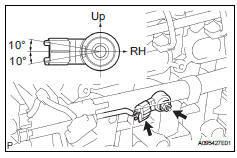 Connect the union to check valve hose to the brake booster. Install the heater water outlet hose to the water bypass pipe and heater radiator unit. 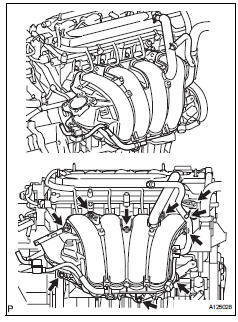 Install the heater water inlet hose to the cylinder head and heater radiator unit.